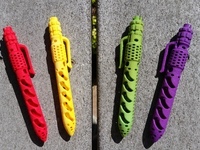 Multi-Color Pen by MosaicManufacturing is licensed under the Creative Commons - Attribution license. Sell me this pen? How about printing my own! Now you can with this multi-color personalized pen, which fits Bic's liquid Cristal Stick ink cartridges. 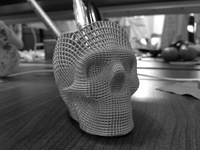 Printed with 2 shells, supports are only needed on the tip of the pen. May need to be scaled to fit ink (use Bic liquid Cristal Stic ink https://www.amazon.com/Cristal-Stic-Medium-Ball-Black/dp/B004DBHR2Q/).